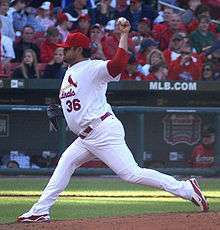 Dennys Reyes (Spanish pronunciation: [ˈdenis ˈreʝes]; born April 19, 1977) is a Mexican former professional baseball pitcher. He played for ten teams over a more than decade-long major league career. Reyes throws left-handed and is considered a lefty specialist. He stands 6'3" and weighs 250 pounds. His nickname is "The Big Sweat." Reyes was born in Higuera de Zaragoza, Mexico and attended Ignacio Zaragoza High School in Mexico. He is married to Claudia and has two sons: Dennys Alejando and Kris de Jesus. Reyes has been criticized about his weight. He has a baseball stadium named after him in his native Higuera de Zaragoza, Mexico. Reyes signed with the Los Angeles Dodgers as an undrafted free agent in 1993. He made his major league debut for the Dodgers on July 13, 1997 at age 20. He was the second youngest player in the league at the time, four days older than Atlanta Braves outfielder Andruw Jones. Reyes pitched with the Dodgers for parts of two seasons, compiling a record of 2–7 in 25 games, including eight starts. On July 4, 1998 Reyes was traded by the Dodgers along with Paul Konerko to the Cincinnati Reds for Jeff Shaw. Reyes spent three and one half seasons with Cincinnati from 1998 to 2001. Over that span he pitched in 170 games, starting 14 of them while compiling a record of 9–10 with an earned run average of 4.40. On December 18, 2001 Reyes was traded by the Reds with Pokey Reese to the Colorado Rockies for Gabe White and Luke Hudson. From 2002 to 2005 Reyes pitched for six different organizations: Colorado Rockies (2002), Texas Rangers (2002), Pittsburgh Pirates (2003), Arizona Diamondbacks (2003), Kansas City Royals (2004), and the San Diego Padres (2005). With the Royals, Reyes had career highs in games started (12), innings pitched (108) and strikeouts (91) while compiling an ERA of 4.75. On February 21, 2006, Reyes signed a free agent contract with the Minnesota Twins. In 2006, Reyes posted a record of 5–0 with a career-best 0.89 ERA. Post Season Experience last was in the 2009 NLDS vs. Dodgers before that was with the Twins in the 2006 American League Divisional Series against the Oakland A's when he appeared in two games. Reyes continued as a left-handed specialist in the Twins bullpen in 2007 and 2008. In 2008 he had the lowest average pitches per game pitched, with 9. On March 5, 2009, Reyes signed a contract with the St. Louis Cardinals in a reported two-year deal worth approximately $3 million. In March 2011, Reyes signed a minor league deal with the Boston Red Sox and attended spring training as a non-roster invitee. He made the team's opening day roster, and was the only left-handed pitcher in the Red Sox bullpen at the start of the season. On April 8, he was designated for assignment, thus ending his short tenure with the Red Sox. He was assigned to Triple A Pawtucket Red Sox. Reyes signed a minor league contract with the Baltimore Orioles on January 21, 2012. He also received an invitation to spring training. On March 4, 2012 Reyes was released by the Orioles for failure to report to Spring training. He was hurt for most of 2012, however, he signed with the Naranjeros de Hermosillo of the Mexican Pacific League, he pitched his first game for the team as a starter on November 2, 2012. ↑ "St. Louis Cardinals sign LH reliever Dennys Reyes; righthanders shine". St. Louis Post-Dispatch. 2009-03-05. ↑ Pepin, Matt (April 8, 2011). "Felix Doubront activated for game". The Boston Globe.